This year marks 20 years since Menomonee Valley Partners was formed and celebrates 20 years of transformation in the Menomonee River Valley. While it’s becoming known for its trails and parkspaces, the district was once a drain on the community and was known for abandoned buildings, contaminated land, and a certain smell. Efforts to revitalize the Valley began in earnest in the 1990s with a 133-acre parcel (about the size of 100 football fields) just east of Miller Park. 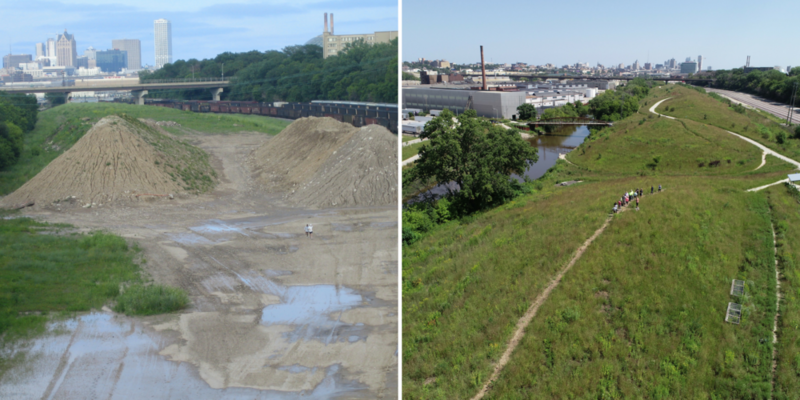 The community looked at the former Milwaukee Road railroad shops, the site of 125 years of heavy industry, and asked that it become a hub for family-sustaining jobs with green spaces where animals would thrive and children could play. The rain date for this event is Wednesday, May 15, 5:15-6:30pm. We'll let you know by noon on May 13 if the walk will be delayed. We’re a proud partner of Jane’s Walk MKE. Jane's Walks are free, resident-led neighborhood walking, biking, paddling, and transit tours throughout the entire month of May that get people together to explore, talk about, and celebrate Milwaukee's many neighborhoods. Jane’s Walk MKE is part of a worldwide movement of over 200 cities inspired by urbanist and writer Jane Jacobs, but Milwaukee is unique by expanding Jane’s Walk from one weekend to the whole month! Jane Jacobs (1916-2006) was a writer, urbanist and activist who championed the voices of everyday people in neighborhood planning and city-building.